If you're looking for a dance- and Pilates-inspired workout -- or just want the occasional alternative to hitting the weight room -- Pure Barre might be right up your alley. The boutique fitness method combines the muscle-toning and posture-improving techniques of ballet and Pilates for a workout that creates tight, lean muscles without adding bulk. But while Pure Barre exercises are a worthwhile addition to your fitness routine, they won't burn a significant number of calories. 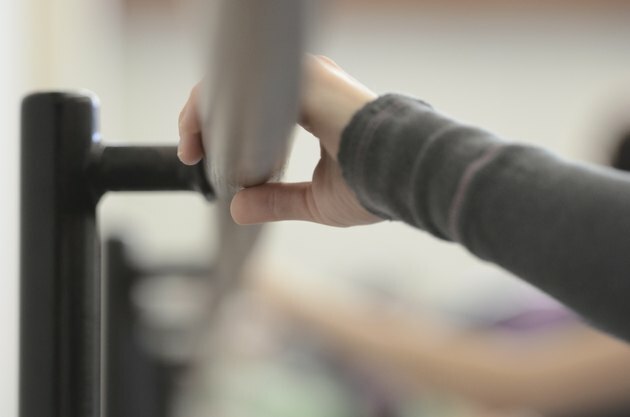 Each Pure Barre class is slightly different -- the instructors don't have a set sequence of exercises to follow and get to create variety from class to class -- but each lesson includes ballet-inspired exercises like plies along with core-toning staples and Pilates movements, like planks and leg lifts. You'll often start each class using light weights to perform arm-toning exercise, then move into isometric exercises that involve 1-inch movements -- for example, leg lifts -- to tone your midsection and lower body. Each class ends with a brief cool-down, when you'll perform stretches to increase your flexibility. Overall, this type of exercise helps you get stronger, improves your body alignment and boosts flexibility. Pilates-inspired exercises, like the ones you'll do at Pure Barre, also improve your ability to make functional movements -- the type of movements you make in everyday life, like lifting objects or standing up and sitting down. Under the supervision of a professional, Pilates-inspired movements can also help with rehabilitation or improve your performance in other sports. While Pure Barre exercises can get your muscles burning, they won't torch a ton of calories. Your exact calorie burn depends on exactly which movements your instructor chooses, but you'll generally perform a mix of Pilates, calisthenics -- like squats and plies -- and stretching. A 40-year-old, 150-pound woman who stands 5-foot-4-inches tall burns about 255 calories in a 55-minute class. If you're in a particularly tough class that involves more squats and plies, you might have a slight increase in your calorie burn. So if your instructor spends 35 minutes on calisthenics, 15 minutes on Pilates-based moves and five minutes on stretching, that same 40-year-old woman would burn 265 calories. A few factors affect your calorie burn during class, including your weight. That 40-year-old, 150-pound woman who burns 255 calories in a typical Pure Barre class would burn 297 calories if she weighed 175 pounds, or 212 calories if she weighed 125 pounds instead. Muscle is more metabolically active than fat tissue, so if you are muscular with a low body fat percentage, you might burn more calories than someone of the same weight with less muscle tissue but more body fat. Because your body size and the exercise routine of each Pure Barre class can affect your overall calorie burn, there's no one-size-fits-all answer for how much energy you'll use in your class. For an accurate, personalized calorie burn, wear a heart rate monitor or fitness monitor to class -- it can gauge your exertion using your heart rate to provide a personalized calorie-burn measurement. No matter how you slice it, Pure Barre isn't a fast track to weight loss -- it simply doesn't burn enough calories to melt a significant amount of fat. For example, a 155-pound person will burn 320 calories in an hour doing moderate exercise on the stationary bike or rowing machine, and will torch 670 and 706 calories on the elliptical or ski machine, respectively -- significantly more than the calories burned in a Pure Barre class. Instead of relying on Pure Barre exercises as your primary way to lose weight, think of them as a complement to a regular aerobic exercise routine -- the cardio will burn fat and calories, as well as promote heart health, while the Pure Barre classes strengthen and tone your body while improving flexibility. Pair your well-rounded exercise routine with a calorie-controlled diet, made up of wholesome, filling foods, to reach your weight-loss goals.